Since 2011, FIFA Encyclopedia has been the internet's premier resource for anything FIFA-related. We work to provide the most informative, helpful, and thorough tutorials, videos, and other instructional pieces. We provide free content for FIFA 08 through FIFA 14. If you have any suggestions as to how we can improve your experience or if you have any questions, please do not hesitate to contact us! We hope that FIFA Encyclopedia is helpful to you. Please like our Facebook and follow us on Twitter for even more exclusive FIFA content. Mastering the two on one offensive is not all that difficult, but many people still manage to mess these up. They are basically a gift of a goal if you know what to do. It may sound silly, but one of the most helpful things you can do to improve your win-loss ratio is to simply go into games with a premeditated game mentality. This means you need to decide whether you’re going to sit back and defend and hope you might get a goal or two for the win, or if you’re just going to go for all out attack and hope whatever comes your way does not end up in the back of the net. Crossing has always been one of the easiest ways to score in FIFA. Next to corners, it is the hardest thing to defend well in FIFA. If you do everything right, your opponent can be simply helpless in defending your crosses. Creating shots is an integral part of being successful at FIFA 15. 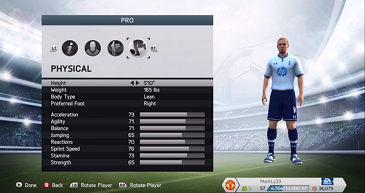 In FIFA 15, it is much easier to put away mid to long distance shots than in previous versions of FIFA. I’m not talking about finishing breakaways or general 1v1s, but just deciding to shoot when the alternatives are dribbling or trying to pass someone through. Sometimes, it’s just better to go with the shot when you have a chance, but the difficulty is actually making those shots. Passing is undoubtedly the most important skill to master if you wish to win more often in FIFA. Furthermore, passing well enough to maintain possession both for a large amount of time and with an attacking purpose is a level of prowess you must reach in order to be a more competitive player -- whether when playing with your friends or in competitive matches online. FIFA has had one of the best video game soundtracks for many years now, and FIFA 15's soundtrack is among the best of them. EA has focused on finding great bands from all over the world to compile a diverse group including artists like Milky Chance (Germany), Santé Les Amis (Brazil), and Kasabian (England). Here is a list of all songs in the FIFA 15 soundtrack. FIFA Encyclopedia Ebooks Giveaway - Multiple Chances to Win! We're giving away even more this week! As you may know, FIFA Encyclopedia has two ebook offerings, the FUT Genius 14 Guide, an exclusive insider's guide to making big money in FUT 14 written by an economics expert, and the Supreme FIFA 14 Guide, our professional strategy guide to winning in FIFA. Read more about FIFA Encyclopedia Ebooks Giveaway - Multiple Chances to Win! Today, EA released the first batch of UT Legends stats. This batch of releases includes Legends #42-31. If you're not familiar with what 'Legends' is, it's a new campaign by EA to include older, retired players in the current version of Ultimate Team. Legends will allow you to play with players like Bergkamp, Ljungberg, or even the great Pele. Today, EA released the first batch of stats for some of these players, which you can view below. EA has released Week 2 of 'Goals of the Week' and you can view them in the video below. Some of these feature pretty impressive shots and fancy dribbles. If you'd like to score more goals like this rather than the same "lucky break and finish" goals over and over, then consider the Supreme FIFA 14 Guide. The Supreme FIFA 14 guide will teach you how to regularly dominate your opponent and score goals like this. Today, FIFA Encyclopedia is proud to announce the release of the FUT Genius Guide! Read more about Announcing: the Supreme FIFA 14 Guide! We've just completed a major site redesign and are only part way through a series of big changes for FIFA Encyclopedia. We've focused on making the site more aesthetically appealing to our users, as before the site didn't exactly have the nicest design. We've brought the site into modern design standards, or at least a little closer to it so you can enjoy a nicer site. Read more about Welcome to the new FIFA Encyclopedia!